What is food processing industry (FPI)? Right from the cultivation and harvest of crop, upto the consumption of product by consumer, there is certain degree of value addition in every product. This value addition can be of numerous types. As it goes from producer, to wholesaler, to retailer and finally to consumer, every stage adds some value to the product. In this value chain there may be value addition by Sorting, grading, packaging, branding etc. These activities not makes product attractive, more usable, gives choice and awareness to customers and also enhances shelf life of products. Apart from this service rendered by intermediaries to pass on product from producer to customer is also valuable. Most of the agricultural products are not consumable in their original form, for which they are processed. Wheat is converted into flour, Paddy into rice, sugarcane into jagery, Sugar, ethanol, alcohol etc. These products can be further processed such as flour into bread. Apart from this, left over part of crop such as risk husk can also be processed to get some useful product for e.g. Rice Bran oil, cattle feed, Sugarcane bagasse can be used for power cogeneration. Hence, food processing not merely adds value to the agro products, but also increases their utility. We know that activities in an economy are broadly divided into Agriculture, industry and Services. Food processing Industry is the product of agriculture and Industry. Where India stands and why food processing is important? India Food Processing Industry is estimated at $135 billion industry which is growing at about 8% annually. This growth rate is significantly more than agricultural growth rate which remains around 4%. These signals indicate toward phenomenal shift toward food processing from traditional ways. GDP by processing constitute about 10% that of agriculture. But given potential of India, this is an underachievement. India has about 26 types of different climatic conditions, 46 varieties of soils are there in India out of total 60 types of soils worldwide. 127 ‘agro climatic zones’ have been identified in India. Also, Indian food is known worldwide for its unique taste and aroma. India’s regional and cultural diversity is perfectly reflected in food. Every state in India has something unique to offer. For e.g. South Indian, Gujrati, Bengali, Rajasthani and Punjabi delicacies are different and are admired in many parts of the world. But they haven’t been able to make inroads in other countries the way Mc Donald’s, Domino’s etc. has done in India. This is because lack of creativeness, innovation, branding and most importantly shallow pockets of Indian manufacturers. India is largest producer of Pulses, Mangoes, Banana, Milk, ginger, Buffalo meat and 2nd largest producer of rice, wheat, potato, garlic, cashew nut, groundnut, dry onion, green peas, pumpkin, gourds, cauliflowers, sugarcane, and tea in the world. We produce 17 per cent of the global total of vegetables and 14 per cent in the case of fruits. About 40 percent of the world’s mangoes and 30 per cent of the world’s bananas and papayas are produced in India. Further, India has many unique things to offer such as Alphonso Mangoes and wheat of Madhya Pradesh is uniquely protein rich. No surprise, that India is net exporter of agricultural products. But value addition of Indian product remains quite low. Indian Manufacturers haven’t moved much ahead in value chain. Say If mangoes are processed in to Mango Juice or pulp; it will result in more value addition, industry, employment, GDP and foreign exchange, but we export mainly mangoes as it is. Indian agriculture is infested with post-harvest wastage problem. In category of fruits and vegetables it is about 30-40%. Overall, cost of wastage is estimated at about 18% ranging from 50000 crores to 1 lakh crore. Wastage is attributable to several factors including non-availability of facilities for sorting, grading, packaging, storage, transportation, cold chain and low level of processing of agricultural produce. Food processing can halve this loss. Consequently farmer will able to get more value and consumer will get products cheaper. Consumption patterns in India are rapidly shifting from cereals to protein rich foods and horticulture. Also India has significant proportion of population which is undernutrition (1/3 of population), stunted and wasted. Horticulture and fruits are much desirable for this problem and wastage reduction will have decisive impact here. Food processing has potential to turnaround whole economy. Indian economy is still agrarian, because about 55% population is directly dependent upon agriculture. FPI directly targets farming sector as it attempts to create more types of products out of single crop. This will increase demand for farmers and hence more remunerative prices. India’s demographic dividend is much talked about and most of this lies in rural India. Indian youth is turning away from agriculture because of low profitability. FPI is perhaps best bet to seize opportunity of demographic dividend. It can give us a genre of progressive rural entrepreneurs. Prosperous countryside will have multiplier positive impact on socio-economic and political problems. In short, FPI can narrow gap between rural and urban India. Apart from this India’s economy is under transition, Income classes are moving upward. Every year millions of households are coming out of poverty to be part of middle class. Per capita income is Increasing as GDP growth rate is much higher than population growth rate. This is complimented by growing urban culture, nuclear families, working couples. This makes case for processed food compelling. Consumption in India is gradually tilting towards packaged and ready-to-eat foods. Demand is bound to increase, but it has to be seen that to what extent opportunity is seized by Indian industry and how much is left for foreign companies. FPI is employment intensive industry; it can be an answer to jobless growth of past decade. Currently, only 3 % of employment is in FPI, while in developed countries it handles 14% population. Again, much of the employment will be created into rural India. This can remedy problem of distress migration. Growth in direct employment in the organized food processing sector stands at 6 % between 2011-12. Also, strategic geographic location and proximity to food-importing nations (Middle East and Africa) makes India favorable for the export of processed foods. Last but not the least, world economies are integrating even rapidly year by year. So a country has no option but to remain competitive. Food processing is one of the largest global sectors at $7 trillion annual production. Look around and you’ll find companies of Cold drinks, Wafer chips, Juice, restaurant chains to be among biggest ones. Italian pasta and pizza is now consumed in almost all countries, so are the burgers and sandwiches. Sugar free products, cornflakes, oats, ketchups etc. are among most demanded consumer goods. Currently only 2 % of India’s vegetable and fruits production is processed. In comparison USA and China processes their 90% and 40% produce. Other developing countries, such as Thailand, Philippines, and Brazil are processing as high as 30, 78 and 70% of their produce. Importance of this sector is significant and it deserves a priority treatment by government. Accordingly sector has been made part of ambitious ‘Make in India’ initiative. Supply Chain – Any product is mobilized from producer to consumer to be consumed. This route is called supply chain. This movement involves both time and costs. Lengthier supply chains will push prices upward and result in more wastage. In last articles regarding marketing of agro-products we came across various government policies and institutions, which among other things, increase number of intermediaries. Adequate storage facilities, direct farming, contract farming and negotiable warehouse receipt system are mechanisms to streamline, strengthen and shorten the supply chain. Apart from these issues other major interventions and investments are needed in infrastructure sector, which is backbone of food processing industry. We have seen that India is biggest producer of numerous fruits and vegetable. Most of these are perishable and have very low shelf life. This is the major reason for high percentage of wastage. Their shelf life can be increased by adequate investment in infra such as cold storage, reefer vans, radiation plants etc. 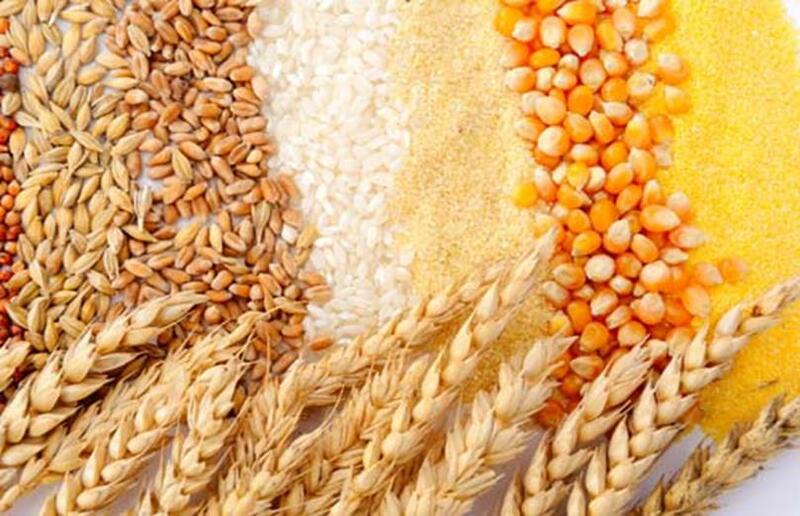 Storage of foodgrains – FCI deals only in food grains and about 67 per cent of the storage capacity is concentrated in the six major procuring states namely, Punjab, Haryana, Uttar Pradesh, Andhra Pradesh, Rajasthan and Uttrakhand. Several States have emerged in recent years as important states for foodgrains procurement, namely, Bihar, Odisha, Jharkhand, West Bengal, Madhya Pradesh and Chhattisgarh presently account for 13 per cent of the current storage capacity. Under the National Storage Policy, the bulk grain handling facilities are now being created on the Built Own Operate (BOO) basis at identified locations in the country. Much of the problem here can be relieved by timely offloading of stocks. Storage of Horticulture products – Mainly NAFED – it also owns godowns and cold stores. India is currently having severe shortage of cold storage facilities. 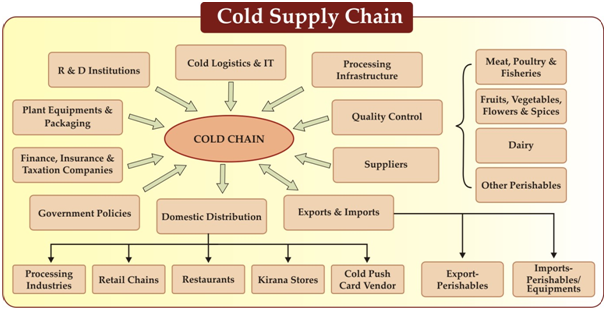 Significant majority of cold storage facilities were created between 2000 and 2011, assisted to some extent by interventions from National Horticultural Board (NHB), National Horticultural Mission (NHM), Horticulture Mission in North East and Himalayan States, Agricultural and Processed Food Products Export Development Authority (APEDA), Ministry of Food Processing Industries and Department of Animal Husbandry & Fisheries. Cold stores are to some extent product specific. Majority of the cold stores in India are dedicated to potatoes. There are some that provide storages for chilies, dry fruits, spices, vegetables etc. Cold storage for meat, fish, milk and milk products and for other commodities such as spices account for only 1 percent of the total cold storage capacity. These cold storages are also usually smaller in capacity. Nearly 96 per cent of cold storages are in the private sector and about 75 percent capacity of cold storages is used to store only potatoes while another 23 per cent fall under the multi-product category. Suppliers to a producers or trader lie on upstream side, where as customers lies on downstream side. This will change according person under observation. For a farmer, supplier of seeds and fertilizers lie on upstream, while cold store owners, farm contractors, mill owners, traders in agro output lies on downstream. When a particular person in supply chain assume role of two levels it is said integration. If PepsiCo instead of procuring potatoes (for chips) from farmers get potatoes captively from its own lands, it will be called backward integration. On other hand if farmer puts up a processing plant for chips, or a cold storage, this will be called forward integration. Direct farming is also a forward integration, where farmer assumes role which was played by commission agent in APMC. Forward and backward integration, also called vertical integration, is common in any business and it saves the costs associated with supply chain. Business which pursues integration strategy, earns a competitive edge. For example Reliance Industries owns oil and exploration business, refining business, retail outlets for petro products, and is India’s biggest polyester manufacturer. Consequently RIL has almost monopoly in these sectors. In farming and food processing, vertical integration can work wonders. For this farmer needs financial and technical support. Agriculture in India already is overemployed. This with seasonal nature of majority of farming crops gives farmers a compelling reason to get into food processing business. a) The Ministry is nodal agency for FPI and is concerned with formulation and implementation of the policies & plans for the food processing industries within the overall national priorities and objectives. b) Facilitating creation of a conducive environment for healthy growth of the food-processing sector. f) Assistance for setting up analytical and testing laboratories, active participation in the laying down of food standards and their harmonization with international standards. i) Decentralisation in the implementation of various schemes with greater involvement of the States/UTs. The Ministry has launched a new Centrally Sponsored Scheme-National Mission on Food Processing (NMFP) with effect from 01.04.2012.
has set up common infrastructure facilities like ‘centre for perishable cargo’ at various international airports. Facilities such as Vapor Heat Treatment plants, irradiation facilities, integrated pack houses, pre-cooling facilities, and high humidity cold stores for specific horticulture products are also there. Additionally, it provides financial support to exporters for installing facilities such as Reefer Vans and in-house above mentioned facilities. Similarly, Marine Products Export Development Authority (MPEDA) is there for fishery production and related activities. The Department is responsible for matters relating to livestock production, preservation, and protection from disease and improvement of stocks and dairy development, and also for matters relating to the Delhi Milk Scheme and the National Dairy Development Board. It also looks after all matters pertaining to fishing and fisheries, inland and marine. The Department advises State Governments/Union Territories in the formulation of policies and programs in the field of Animal Husbandry, Dairy Development and Fisheries. Transfer of technology to producers/farmers and service providers such as gardeners, farm level skilled workers, operators in cold storages, work force carrying out post-harvest management etc. 100% FDI is permitted in the automatic route for most food products except for items reserved for micro and small enterprises. 100% FDI is permitted for alcoholic beverages, with the requirement of an industrial license. For pickles, mustard oil, groundnut oil and bread – items reserved for the micro small and medium sector, 24% foreign direct investment is allowed under the automatic route, with the requirement of prior approval from the Foreign Investment Promotion Board for FDI amounting to more than 24%. Vision 2015 which was adopted in 2010 provides for enhancing the level of processing of perishable to 20%, enhancing value addition from 20% to 35% and increasing India’s share in global food trade from 1.5% to 3% by the year 2015. To achieve these targets, investment of Rs.100 thousand crores was estimated by year 2015, out of which Rs.10000 crores was to come from the Government. Vision 2015 provides for establishment of 30 Mega Food Parks in public-private partnership, so far 21 such projects have been approved and approval of 4 projects is pending. List can be accessed here. 1st Mega Food Park to open was in sirni food park in Andhra. Recently ‘Tumkur Integrated Food Park’ was inaugurated in Karnataka. This is the first integrated food park which has been developed with partnership from the Ministry of Food Processing Industries, and the State government. Now list of mega food parks to be set up has gone up to 42, since make in India initiative. 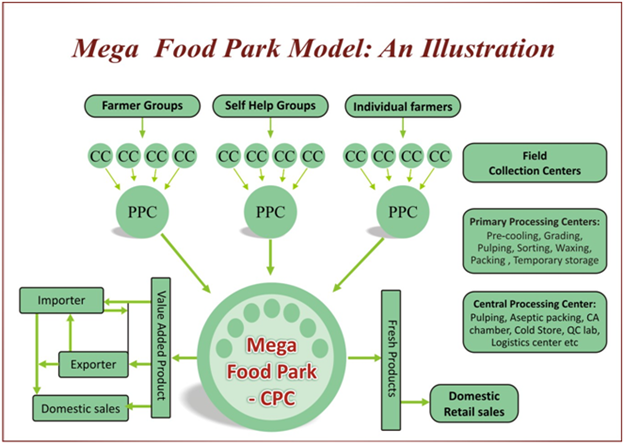 As envisaged by vision 2015, Mega Food Parks, are to be based on ‘cluster approach’. In India there are regional horticultural crops, which are dominantly grown in a particular area. In these areas there is generally cluster of similar farmers, factories, and traders etc. who dominantly deal in same agro product. Scheme aims to strengthen such clusters by providing world class infrastructure facilities. This will result in smoothening of supply chain – ‘Farm to Market’. Hub and spoke model is adopted, as per which there will be a strong Central Processing Unit, which will cater needs of surrounding areas. In surrounding areas, there will be smaller, ‘primary processing centers’ which will be fed from numerous ‘collection centers’. These collection centers will have direct interface with the farmer, farmer groups, or self-help groups. This will lead to vertical integration (backward and forward integration) in activities of that particular area. Central Processing units are to be built under public private partnership. Area for will range from 50-100 acres, though the actual requirement of land would depend upon the business plan, which may vary from region to region. Onetime capital grant of 50% of the project cost (excluding land cost) subject to a maximum of Rs. 50 crore in general areas and 75% of the project cost subject to a ceiling of Rs. 50 crore in difficult and hilly areas, is available. Program Management Agency is appointed by the Ministry to provide management, capacity building, coordination and monitoring support. For meeting the cost of the above and also other promotional activities by the Ministry, a separate amount, to the extent of 5% of the overall grants available, is earmarked. It is expected that on an average, each project will have around 30-35 food processing units with a collective investment of Rs.250 crores that would eventually lead to an annual turnover of about Rs.450-500 crores and creation of direct and indirect employment to the extent of about 30,000 persons. Special Purpose Vehicle is term commonly used in corporate world. It mobilizes funds, expertise and experience of more than one organization toward a common goal. For example a company will be formed by pooling funds of interested parties and this company will be called SPV. Definition, functions etc. of SPV can differ from case to case. In this case it is responsible for ‘execution, ownership and management’ of Mega Food Parks. It aims to facilitate the establishment of a strong cold chain facility for agricultural, horticultural, dairy, fish & marine, poultry & meat products by establishing linkage from farm gate to the consumer, end to end, to reduce losses through efficient storage, transportation and minimal processing. Processing Centre at the farm level and centers is to have facility for weighing, sorting, grading waxing, packing, pre-cooling, Control Atmosphere (CA)/ Modified Atmosphere (MA) cold storage, normal storage and Individual Quick Freezing (IQF). Distribution hubs with multi products and multi Control Atmosphere (CA)/ Modified Atmosphere(MA) chambers/ cold storage/ Variable Humidity Chambers, Packing facility, Cleaning in Process (CIP) Fog treatment, Individual Quick Freezing (IQF) and blast freezing. Financial assistance of 50% the total cost of plant and machinery and technical civil works in General areas and 75% for NE region including Sikkim and difficult areas (J&K, Himachal Pradesh and Uttrakhand) subject to a maximum of Rs.10 crore. Cold Chain for Non-Horticulture Products is also being funded under National Mission on Food Processing which provides Capital subsidy of 35% of cost of project or Interest subvention by 6% (max 5 crore). Also subsidy of 50% is available on investment in ‘reefer vehicles’ (max. 50 lakhs). NABARD too provides concessional finance for construction of warehouses, godowns, silos and cold storage units. This is a comprehensive scheme, which includes establishment of modern abattoirs and modernization of existing abattoirs. Modernization of abattoirs will also include upscaling of infrastructure of existing abattoirs. The scheme is implemented with the involvement of local bodies and has flexibility for involvement of private investors on PPP basis. The scheme envisages a grant of 50% of the cost of plant and machinery and technical civil works subject to a maximum of Rs.15.00 Crores in general areas and 75% of the cost of plant and machinery and technical civil work and other eligible items subject to a maximum of Rs. 15.00 Crores in difficult areas. To give thrust to export of agro products, new concept of Agri Export Zones was brought in 2001. APEDA has been nominated as the Nodal Agency to coordinate the efforts on the part of Central Govt. negotiations. Identification of such potential crops is responsibility of state governments. Projects in such areas for identified crops will be eligible for financial assistance and certain fiscal incentives. These extend from providing financial assistance for Training and Extension, R&D, Quality Upgradations, Infrastructure and Marketing etc. The benefits under Export Promotion Capital Goods Scheme, which were hitherto available only to direct exporters, have now been extended to service exporters in the Agri Export zones. Under this scheme import of capital machinery will be allowed at concessional custom duty, provided importing units commits to export of certain quantity of agro products after commencement of production. Apart from this National Mission on Food Processing is in place since 2012, which subsumed a number of schemes. Main objective of the mission is to decentralize implementation of food processing related schemes to States. The small scale and unorganized sector constitutes about 70% of the food processing sector. Employment intensity is significantly higher in this sector as compared to the organized sector for the same level of investment. Unfortunately, sector suffers from low efficiency due to the lack of – access to credit, managerial knowledge, efficient tools/ technology, marketing network etc. Intense competition from large scale players has also affected it. Further, in export too dominance is of small scale sector. Due to financial constraints they fail to add much value to the products. Real value adding processing happens to most exported products abroad. These products have very low brand value. Lastly, small scale industry is extremely risk averse, afraid of trying new products, technologies, markets. In contrast global companies in competition are giants such as Pepsi, Kellogg’s etc. These companies have huge economies of scale, influence in International politics and invests substantial amount in R&D. At the processing stage small scale industry needs targeted programs to improve productivity, access to technology, credit and downstream markets. This will also enable reduced wastage and nutrition losses in processing. Potential programs could include financial assistance for procurement of machinery, credit, technical advice on productivity improvement and machinery selection and trainings on adopting standardized processes. Many of these initiatives are already there on part of the government, but information deficit and risk avoidance comes in the way. To achieve these objectives to some extent, it is imperative that supply chain infrastructure be built. Organized sector has capacity to build this Infra, which can also cater to needs of Small scale sector. Government has reserved certain Items exclusively for small scale industries which includes pickles, chutneys, bread, confectionery, rapeseed, mustard, sesame oils, groundnut oils, ground and processed spices, sweetened cashew nut products, tapioca sago and tapioca flour. Cooperative sector experiments can also bring small scale sectors into organized form as was seen in success of AMUL and Lijjat Papad managed by cooperative named Shri Mahila Griha Udyog Lijjat Papad. Extensive use of fertilizers, pesticides and other chemicals has raised concerns about quality of food. Further, protection is needed from unfair and hazardous practices such adulteration, Synthetic milk and milk products etc. For this Food Safety and Standards Act was enacted in 2006 prior to which there were plethora of laws under different ministries, which were overlapping and confusing. FSSA was aimed at providing single point reference for all matters relating to food safety and standards. Act established an independent statutory Authority – the Food Safety and Standards Authority of India with head office at Delhi. These along with State FSSAs secure compliance of various provisions of the act. Framing of Regulations to ‘lay down the Standards and guidelines’ for articles of food and specifying ‘appropriate system of enforcing’ various standards so laid. Collect and collate data regarding food consumption, incidence and prevalence of biological risk, contaminants in food, residues of various, and contaminants in foods products, identification of emerging risks and introduction of rapid alert system. Creating an information network across the country so that the public, consumers, Panchayats etc. receive rapid, reliable and objective information about food safety and issues of concern. Provide training program for persons who are involved or intend to get involved in food businesses. food safety and animal and plant health standards. It allows countries to set their own standards. But it also says regulations must be based on science. They should be applied only to the extent necessary to protect human, animal or plant life or health. And they should not arbitrarily or unjustifiably discriminate between countries where identical or similar conditions prevail. Codex Alimentarius Commission is an international agency on food standards in which almost all members of WHO, and Food and Agriculture Organization of United Nations (FAO) are members. These members agree to adopt standards on food established by CODEX. There is also reference, endorsing use of CODEX standards, in WTO’s SPS agreement. Any member nation willing to set standards over and above CODEX will have to give scientific justification and explanation for that matter. HACCP is a management system in which food safety is addressed through the analysis and control of biological, chemical, and physical hazards — from raw material production, procurement and handling, to manufacturing, distribution and consumption of the finished product. This system is recommended by CODEX and used by it for setting standards. ISO is international independent organization, engaged in formulation and setting up of standards for different products including processed food products. It has overtime become a brand and products marked with ISO enjoys premium in markets. It should be noted that ISO standards are not something which is enforced by government, WTO, WHO etc. It is purely voluntary on part of manufacturer. ISO doesn’t certify itself; there are other entities which certify. ISO just set standards. Food safety and hygiene is critical for development of sector. In era of intense global competition countries implement these standards jealously to guard their domestic industries. These sometimes get converted into non-tariff barriers. Recently, India Alphonso mangoes were banned by European Union due to the presence of harmful pests and a lack of certification before export. Food Irradiation – (the application of ionizing radiation to food) is a technology that improves the safety and extends the shelf life of foods by reducing or eliminating microorganisms and insects. Like pasteurizing milk and canning fruits and vegetables, irradiation can make food safer for the consumer. Prepackaged foods can be treated for hygienization and improving shelf-life Only those foods for which specific benefits are achieved by applying appropriate doses, and those duly permitted under the Prevention of Food Adulteration Act (PFA) Rules, 1955, can be processed by radiation. Interestingly, Bhabha Atomic Research Center (BARC) offers ‘ AKRUTI Technology Package for Rural development’ which provides infra and knowhow for radiation facilities. Food processing seems to have promising future, provided adequate government support is there. Food is the biggest expense for an urban Indian household. About 38 % of the total consumption expenditure of households is generally spent on food. This share is declining consistently. As mentioned, food processing has numerous advantages which are specific to Indian context. It has capacity to lift millions out of undernutrition. Government has challenge to develop industry in a way which takes care of small scale industry along with attracting big ticket domestic and foreign investments.